This fall season I had the chance to drop into Roloff Farms near Hillsboro, Oregon. It was rather by chance that my best friend and I stumbled on it. We had not planned to stay in Hillsboro, Oregon, but after a small snafu, we bunked at the local Holiday Inn Express. The manager had asked my friend if we were going to Roloff Farms and that is when it hit us: Little People, Big World! If you are unfamiliar, Little People, Big World is a popular television show on TLC that has aired for 10-years. It is still in production today and well loved by many. I have always admired that even in the reality of life, the Roloff family has kept it together. Most of all, the Roloff family seems to have never let the money and television fame get to their heads. That was very present when we attended their farm for pumpkin season. The nice thing about the Roloff Farms is that pumpkin season means that the family opens their farm to the public. Their hours are usually Friday, Saturday, and Sunday through the month of October. The farm opens at 10 am and gates close at 5 pm with the official closing at 5:30 pm. I highly recommend getting to the farm early for great parking as it does get busy fast. Our tour guide mentioned that 5,000-7,000 people come through the farm per day of opening weekends in October. Wow! We arrived at the farm at 9:40 am and there was already a line at the gate. However, the staff at Roloff Farms does an outstanding job of keeping things running smoothly. It was very impressive. I will mention that even with the number of guests that Roloff Farms sees on a weekend, it does not feel crowded. We spent well over three hours at the farm and it never became overwhelming. The line to get in also kept moving, which was nice. We purchased the most expensive band to see everything the farm had to offer for $14. The price was well worth it for what was included. I honestly did not think it was overpriced at all. If you are just wanting to experience the pumpkin patch, retail store, food trucks, etc., there is no admission. Parking is also free! There are also $10 bands for just the wagon tour and $9 for only the Adventure Area. However, I would spring for the $14 band just in case the Roloff family is in the Adventure Area for photos. If anything, don’t miss the wagon tour. It is about 20-30 minutes long and it is amazing to see all of the sites of this gorgeous farm. The $14 admission covered the wagon tour of the farm, activities, seeing the animals, Adventure Area, and more. There are special discounts that Roloff Farms offers for military, senior, and group. Children under 3-years are free. There is much to see at Roloff Farms. The Adventure Area offers many fun activities for kids. Slides, Kiddy Train, forest trails, mazes, and so much more. I loved the big dig pit they had for the kids. Plus, the Roloff family has two of each farm animal so there are many to see. There is even putt-putt golf. Roloff Farms wagon tours and farm is also wheelchair “friendly”. Making it fun for anyone to attend. Leashed service animals are also welcome. I think one of the highlights of our trip to Roloff Farms was meeting Amy. She is so down to earth and genuine. I asked her about the cookbook she is working on and the conversation was very warm. You can truly tell these people enjoy what they do and love the support they receive. Other Roloff family members were busy at work around the farm and kind to wave and say hello. Everyone had a smile on their face. It makes the farm even more heartwarming because you know there is passion behind this still and the Roloff family wants to simply open their home for others to enjoy. 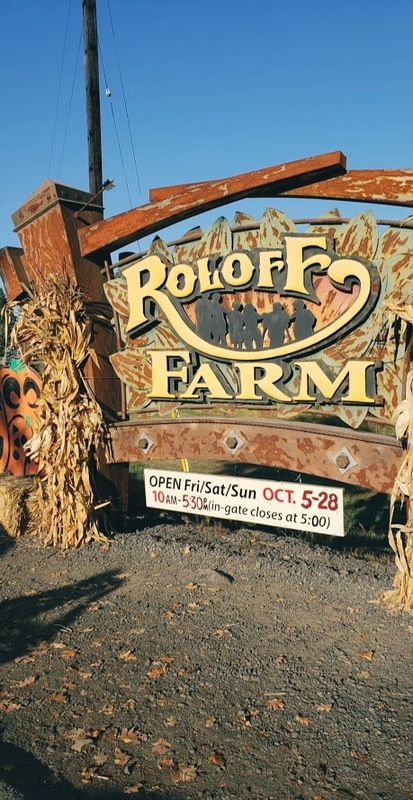 If you are near Portland, Oregon, it isn’t far to reach Roloff Farms. It is well worth the stop to enjoy what the Roloff family offers and bring home an official Roloff pumpkin for the fall season. The Roloff family is a beautiful example of true passion for community and I am honored to have spent time on their property. The wagon tour is great and will leave you enjoying Little People, Big World even more. Even if you don’t watch the show on TLC, you will be inspired by their story. Roloff Farms is a must stop in Oregon.